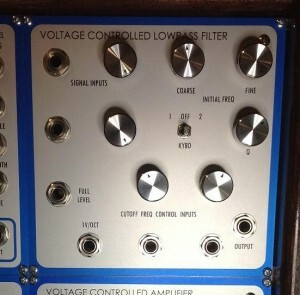 Any analogue synthesizer is only as good as the Voltage Controlled Filters (VCF) that it has. Most of the classic analogue synths (MiniMoog, MemoryMoog, Prophet 5, Oberheim OBXa, etc) only had 24dB Low Pass Filters (LPF) which whilst giving a great sound were a bit limiting. One of my favourite filters was fitted to the Oberheim SEM synth module and this was a MultiMode filter giving High Pass (HPF) Band Pass (BPF) and Notch (NF) outputs as well as the usual Low Pass. In addition the filter had resonance on all the modes which meant it could create some very different sounds from those synths limited to an LPF. The design of the Oberheim filter was relatively straightforward using 2 transconductance amplifiers (CA3080s), which gives a 12dB response, and this type of circuit was also used on the Emu Resonant Filter as well as being the basis for the SSM2040 filter IC. Note that the SSM2040 had 4 transconductance amplifiers in it so it can give a 24dB response. 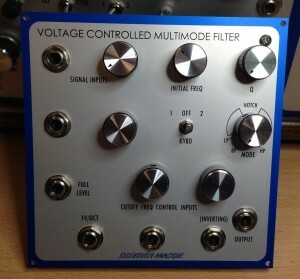 I used 2 MultiMode filters in the Aviator and have just completed a new MultiMode Filter Module, in the Emu style (see pictures), with the circuit based on the Oberheim design. As previously mentioned the Emu Resonant filter was basically the same design and having done a side by side test they do sound very very similar. More details of the MultiMode filter can be found on the Modules page. The other filter I have reworked is a Low Pass Filter utilising the SSM2040 circuitry. Dave Rossum was instrumental in helping to design the SSM ICs and although an Emu LPF module using the SSM2040 was not built (as far as I can establish) Emu did use the IC in their Synthesizer Voice Card and in the later version of the High Pass Filter module. The SSM2040 is renowned for producing the “smooth” sound of the early Prophet 5s (Rev 1 & 2). Later Prophet 5s used CEM ICs. This ‘new’ LPF is therefore the Emu LPF that might have been built if Modular construction had continued. In a side by side test with the original transistor based LPF, in my opinion, the SSM2040 version does sound smoother and is a 24dB filter, just like a Moog!